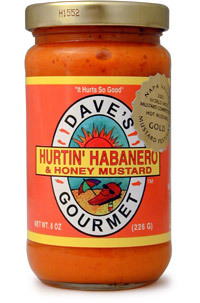 This Hurtin' Habanero and Honey Mustard Hurts So Good!! Winner of the Napa Valley World Wide Mustard Competition in 2001, this mustard has a great taste, great heat, and it is a wonderful addition to those bland foods, including hot dogs and hamburgers. I have used Dave's it products for years. It started with just some mild hot sauces and has graduated to the use of Ultimate Insanity and Hurting Habenero Honey Mustard. The sauces taste greater and mix well with just about anything. I love this sauce for dipping my chicken. I buy it all the time! Apr 21, 2018 | By Paul K.
This hands down is the best mustard I've had in years. The sweetness is just right and once that wears off, the heat kicks in. Pleasant. Tasty!! Great on soft pretzels, hot dogs, sandwiches or dipping cheese in. This is delicious. The sweetness cuts the heat enough that you can use it on anything. Of course, those of the faint of heart still feel the pain.